CES 2018: Lenovo Smart Display announced with Google Assistant and 8/10-inch display. Lenovo has today announced the new Smart Display with the Google Assistant built into a vibrant full HD touchscreen display and wrapped in a minimalist, modern design. It's the ideal home companion for busy families who need easy-to-use, time-saving technology. The Lenovo Smart Display is available in both 8-inch and 10-inch models, and the display can be positioned horizontally or vertically to fit nearly any space. When not in use, the display doubles as a digital picture frame - showcasing an ambient screen of beautiful pictures from a personally selected album in Google Photos, or another background image of your choosing. Available in a soft Grey or natural Bamboo color, it matches most wooden, glass or granite tabletops. Powered by the newly announced Qualcomm Home Hub Platform based on the Qualcomm SDA 624 SoC which features integrated CPU, GPU and DSP as well as robust Wi-Fi and Bluetooth connectivity. 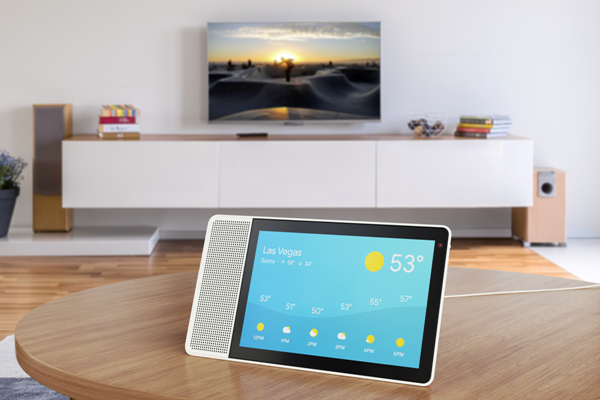 With the Google Assistant, the Lenovo Smart Display is a singular command hub for your connected smart home devices, including those through Nest and other manufacturers from lighting to heating and more - all with just your voice or touch. With the Lenovo Smart Display, the Google Assistant can help you kickstart your morning and get the latest weather, traffic and meeting schedules or you can relax in the evening by video calling friends with Google Duo, watching YouTube videos, enjoying your favorite tunes or managing your connected devices - all with just your voice and a quick glance at the display. The 10-inch Lenovo Smart Display starts at $249.99 and the 8-inch model starts at $199.99, both expected to be available early this summer.